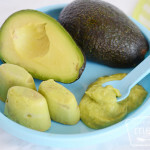 Avocado Baby Food Ingredients 1 avocado Directions Cut a avocado in half and remove the pit. Scoop out the flesh and mash together with a little bit of your baby’s usual milk, until desired consistency. 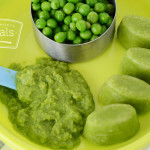 What to do after you freeze your baby food?? 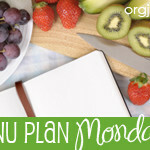 Well, with the start of this new site, that means there is a great place to post my weekly menu’s. This week is a funny one to start out with considering that BlissDom ’09 is at the end of the week and I won’t be home to cook! Oh well! Enjoy! But I Don’t Have a Big Kitchen! Having a small kitchen shouldn’t discourage you. Just a little bit of planning beforehand can help you use your small space as efficient as possible. 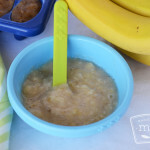 Starting solid foods with baby is an exciting and fun time. 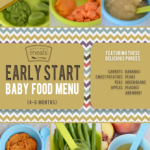 With this menu from OAMM, you can fill your freezer for the weeks ahead by making your own baby food. Best of all, we’ve done most of the work for you! 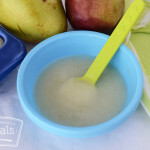 Baby Food Pear Recipe Ingredients: 3 lbs. of pears Directions Place pears in stock pot and cover with water. Bring to boil for 5 minutes or until pears are soft when forked. Drain. 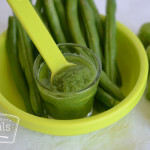 Puree in food processor. Yield: 26 oz…. 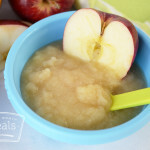 Fall is one of the great seasons for freezing apples for your baby. They are great as a fruit staple or mixed with other fruits as your child gets older. Remember, when properly stored they can last several months, so feel free to make ahead. 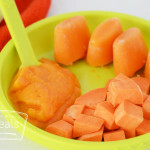 Fall is a great time to prepare sweet potatoes for your little one! They are most commonly on the greatest sale in late November. Remember you can store frozen cubes in freezer bags for several months. Feel free to make them ahead! 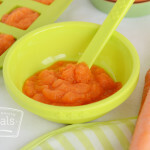 Here are some quick conversions to help you as you go about making your own baby food at home. 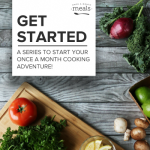 We’ve set this site up to give you helpful resources and suggestions for making your OAM Cooking easy and affordable! Check out the four easy steps. Preparing for a Successful OAM BIG DAY!